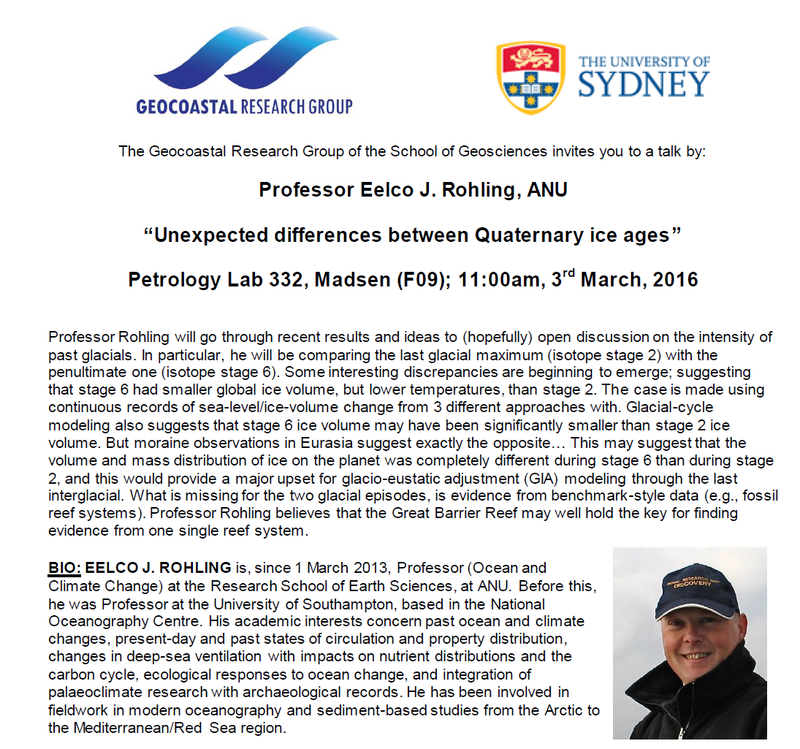 On 3rd of March, we will have a guest presentation by Professor Eelco J. Rohling from Research School of Earth Sciences at ANU. He is one of the leading scientists on Ocean and Climate Change, and will present a talk entitled “Unexpected differences between Quaternary ice ages”. Professor Rohling will go through recent results and ideas to (hopefully) open discussion on the intensity of past glacials. In particular, he will be comparing the last glacial maximum (isotope stage 2) with the penultimate one (isotope stage 6). Some interesting discrepancies are beginning to emerge; suggesting that stage 6 had smaller global ice volume, but lower temperatures, than stage 2. The case is made using continuous records of sea-level/ice-volume change from 3 different approaches with. Glacial-cycle modeling also suggests that stage 6 ice volume may have been significantly smaller than stage 2 ice volume. But moraine observations in Eurasia suggest exactly the opposite… This may suggest that the volume and mass distribution of ice on the planet was completely different during stage 6 than during stage 2, and this would provide a major upset for glacio-eustatic adjustment (GIA) modeling through the last interglacial. What is missing for the two glacial episodes, is evidence from benchmark-style data (e.g., fossil reef systems). Professor Rohling believes that the Great Barrier Reef may well hold the key for finding evidence from one single reef system. Where: Petrology Lab 332, Madsen (F09), School of Geosciences, University of Sydney. ← The GRG celebrates Chinese New Year!